Unlocking American Business, Capital & Consumer Markets! 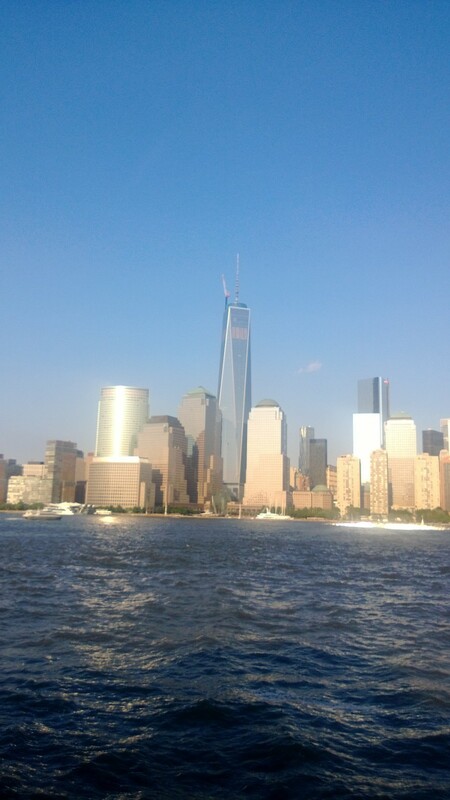 Sitting in my office, at the heart of New York’s financial district and looking out at the Statute of Liberty, New York Harbor and the curves of the Verrazano Bridge majestically suspended over the Narrows Straits, I cannot help but put this amazing American gateway into the context of international business. In today’s rapidly changing and ever more global world, two distinct business trends have become more evident then ever. Just like ships sailing in and out of the New York Harbor, these trends are an Inbound desire to tap American markets by international investors and companies, counterbalanced by an Outbound quest by American Companies, investors, exporters and franchisors to enter rapidly growing Emerging markets around the world. Opportunities for both inbound and outbound market participants are phenomenal. Although American markets can be considered mature and are highly competitive, the U.S. still represents one of the top three global consumer and business markets. It has the most developed regulatory and legal systems, attractive business environment, reasonably priced real estate and inexpensive currency. U.S. also has terrific brand equity as a nation. It is perceived as a very high quality manufacturer of goods, leader in technology development and commercialization, creator of global franchise brands and systems, as well as home to leading educational institutions and financial markets. Despite problems and issues that exist, it is still the gold standard for capital safety and trendsetter of global culture. Many companies, individuals and scientists seek to tap numerous American business and consumer markets. Some come as investors, buyers of real estate, seekers of technology partners or licensees, buyers of Franchise rights, or sellers of their products and services; others seek to tap American manufacturing know how, purchase U.S. goods and services, tap our financing markets or learn how to use U.S. government’s trade and development programs to help them finance projects abroad. No matter what their goals are, inbound investors clamor to unlock American markets and secure their own piece of the American Dream. At the same time, as their economies grow, emerging market countries are aggressively building infrastructure, and developing their own commerce. These countries need a host of sophisticated human, technological and financial resources such as equipment suppliers, professionals, investors, franchisors et cetera from outside their borders to help them capitalize on their potential. Many companies from North America particularly from the U.S., are eager to provide outbound products or services to these rapidly developing markets. However, markets of connecting these buyers and sellers are extremely inefficient to say the least, wasting valuable time and money. There exists a need for a potent entity, that would deeply understand both inbound and outbound international business markets and have professional capabilities to offer effective and comprehensive market sentry services to companies with annual revenues of up to $750 million, or so. Very few entities have the needed understanding, depth and breadth to provide such services on their own. But, if a few experienced and reputable players combine their resources and expertise the results can be fantastic. 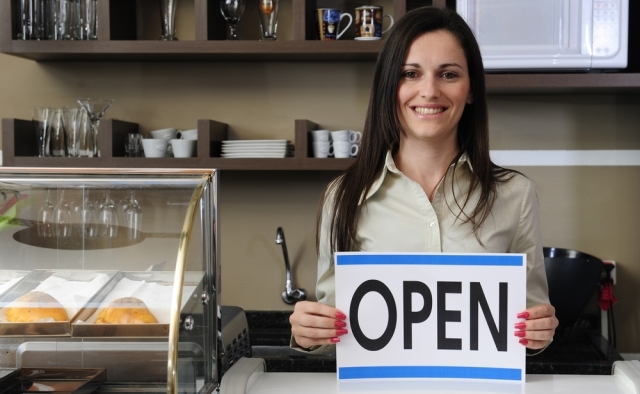 Our Immigration System Must Encourage Foreign Entrepreneurs to Invest in the U.S. Immigrants started 33 percent of U.S. venture-backed companies between 2006 and 2012 that went public, according to a new report from the National Venture Capital Association. The report, however, also noted that there is no reliable immigration program for foreign entrepreneurs, who must surmount enormous legal difficulties in order to come here to create businesses and drive innovation and job growth. The bills are not perfect, but they represent a crucial step towards creating a functional immigration system that will drive innovation, growth, and prosperity. Despite the fact that immigrant-founded venture-backed companies create enormous value in the U.S., no immigrant entrepreneur visa exists. The current E-2 investor visa is often unavailable to entrepreneurs because it can only be used by companies owned by nationals of countries that have treaties with the U.S. There is no such treaty with many countries, like India, that produce the largest percentage of foreign entrepreneurs. Minette Kwok , an immigration attorney and partner at Minami Tamaki LLP, told Immigration Impact that in addition “most start-ups seek venture capital funding from U.S. investors, so that an E-2 company ends up disqualifying itself because it becomes majority U.S. owned”. The E-2 is also a temporary visa valid for only 2 years at a time, and does not lead to permanent residence (a “green card”). Other commonly used business visas, such as the H-1B visa, are also often unavailable to entrepreneurs. The yearly quota for the H-1B visa, which is only 65,000, has been exhausted before the end of the fiscal year every year for the past decade, and ran out this year in less than 5 days. The H-1B is now even harder for entrepreneurs to use, since recent policy changes forbidding “self-employment” now often prevent them from working at their own companies. Therefore, entrepreneurs often must first find work with other companies in the U.S. who can sponsor them, or find another avenue to come to the U.S., and face endless bureaucratic obstacles. Even if a foreign entrepreneur obtains employment at another company it is often impossible for the company to sponsor them because H-1B visas are unavailable and the green card process is expensive and plagued by backlogs that result in waitlists that are decades long for many nationalities. For Indians, the leading creators of successful foreign-founded venture-backed companies, wait times for permanent residency may be as long as 70 years. The process is also incredibly expensive, with the cost of an H-1B visa over 6 years amounting to $19,000, and sponsoring a foreign worker through the complete H-1B and green card process costing $50,000, according to the National Venture Capital Association report. Immigration applications are also often capriciously denied and sponsoring companies are increasingly subject to compliance audits, with 30,000 such on-site audits being conducted in FY 2010-2011. The lack of an entrepreneur visa and of a functional business visa system is a serious roadblock to U.S. innovation and economic growth. In fact, the National Venture Capital Association found that 90% of native-born and foreign-born company founders believe a startup visa would benefit the U.S. economy. Additionally, the Ewing Marion Kauffman Foundation has found that a startup visa with an annual quota of 75,000 would create 1.6 million new jobs in ten years. The Senate immigration bill, S.744, and the House skilled immigrant worker bill, H.R. 2131, would address some of the problems. Both bills propose an entrepreneur visa that would grant permanent residence. Both require that the entrepreneur attract venture capital of at least $500,000 and create at least five full-time jobs. The Senate bill also creates a temporary entrepreneur visa lasting 3 years that requires a $100,000 investment and the creation of 3 jobs. Both bills also make other fixes, like raising the cap on H-1B visas, increasing the number of employment-based permanent resident visas, and eliminating the per-country caps that create backlogs. The bills are not perfect, but given the many problems that foreign investors, entrepreneurs, and U.S. businesses currently face bringing foreign investment and talent to the U.S., they represent a crucial step towards creating a functional immigration system that will drive innovation, growth, and prosperity. 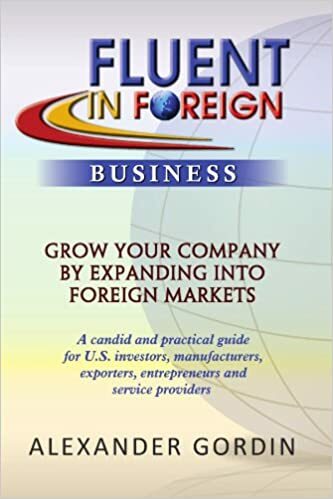 Fluent In Foreign Business EXCLUSIVE! Distributed Generating Company, LLC of Samara, Russia (“DGC LLC”) announced today that it selected Broad Street Capital Group as its exclusive financial advisor for the development and financing of a state-of-the-art distributed power generation utility in the Russian Federation. The proposed $220 million project will launch in July with support of Eurostar Developments LTD and financing that is being arranged in two phases through a combination of owner’s equity, senior bank loans and guarantees from the Export Import Bank of the United States (U.S. Ex-Im Bank). “We aim to serve those mid-size industrial clients throughout the Russian Federation, who are interested in a reliable, low-cost clean energy supply to their facilities. Our clients will commit to long-term power purchase agreements and will in turn receive better service, lower pricing and greater control over their energy needs. DGC LLC will utilize US produced micro-turbines as its building blocks and will be the largest distributed energy utility in Russia.” said Viacheslav Sheianov, DGC’s Owner and Chairman of the Board of Directors. “This project will utilize innovative financing structures and will showcase the latest technological advances in distributed energy generation. It will create hundreds of jobs and provide yet another superb opportunity for U.S. cooperation with the Russian companies” Gordin added. About Distributed Generating Company, LLC. DGC, LLC is an emerging power generation company based in a special economic zone near Samara, Russia. At the helm of the company is an experienced, highly reputable team led by Dr. Viacheslav Sheianov, a well-known businessman and banker with extensive track record of developing and financing large, high-profile domestic and international ventures. DGC’s focus is on serving well-capitalized midsize industrial production companies that have significant energy consumption needs. Great education, helpful mentors, and a willingness to foster new skills make the U.S. ideal for starting a business, said panelists at a White House event. We recently asked whether Americans are overconfident about entrepreneurship, but apparently immigrants are excited to work here, too. On Wednesday, the White House Office of Science and Technology Policy honored eleven immigrant innovators in conjuction with the Champions of Change project, which hosts weekly panels on entrepreneurship. “Immigrants have long made America more prosperous and innovative, and the champions we are celebrating today represent the very best in leadership, entrepreneurship, and public service,” said Todd Park, assistant to President Barack Obama and chief technology officer for the White House. Today’s panel featured six U.S.-based entrepreneurs who moved to the U.S. for college and launched their business here afterwards. Everyone agreed that an American education, the country’s rich network of entrepreneurs and mentors helped their start-ups get off the ground. There is a willingness to take on risks within the tech and science sectors, noted Jonas Harlow, founder of Fleetlife Inc. Even investors are willing to finance long-term projects if they feel the idea is worth it. Victoria Ransom, founder and CEO of Wildfire, said she noticed a similar trait among U.S. employers. Unlike their foreign counterparts, who were more apt to judge a candidate by their diploma, Americans were more willing to consider how they could train these future employees in transferable skills such as research, communications, and writing. What they want most, she said, is someone who is a quick learner, regardless of background. It’s all about the idea, not the education or accent, chimed in Zack Rinat, founder and CEO of Model N. Entrepreneurs. Anyone can find potential backers if their idea is smart. In fact, he and the other panelists admitted to investing in other U.S.-based companies. Perhaps that’s why the White House tweeted today that immigrants started 28 percent of all new businesses in the U.S. in 2011–and launched 25 percent of public companies backed by venture capital such as Yahoo! and Google. Chinese Hot Pot Chain Hai Di Lao Makes Move to U.S.
Boasting waiting rooms with free manicures and servers who dance with noodles, popular Chinese hot pot chain Hai Di Lao is planning to break into the U.S. market. The WSJ‘s Laurie Burkitt speaks with Hai Di Lao CEO Zhang Yong about what diners can expect to find at the hot pot chain. If P.T. Barnum had ever opened a restaurant, it might look a lot like Hai Di Lao, the popular chain of 75 Chinese eateries planning its first foray into the U.S. market this fall. Talk about a three-ring circus: Diners pass the time in the waiting area with Internet terminals, board games and kids’ toys. They can nibble on unlimited free snacks. Or kick back for a shoeshine, manicure or hand massage. Gilles Sabrie for The Wall Street Journal Placing noodles in a Hai Di Lao hot pot. Gilles Sabrie for Wall Street Journal Patrons waiting for a table pass the time with Chinese checkers and snacks. 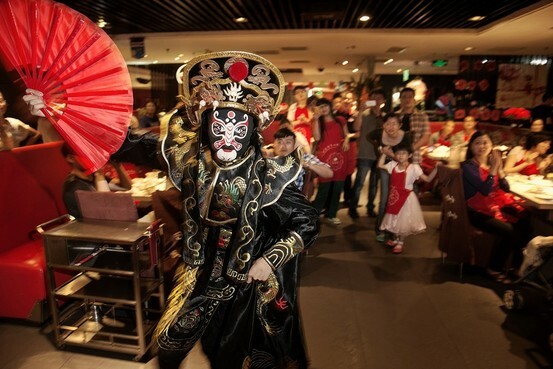 Owner Zhang Yong, who launched Hai Di Lao in Sichuan in 1994 and opened his first international branch in Singapore last year, hopes the touches that established his brand in China will also pave the way for his first U.S. outpost. It is scheduled to open this September in the affluent Los Angeles enclave of Arcadia. Hai Di Lao has the potential to do for Chinese cuisine what Benihana Inc.—famous for its hibachi-style restaurants where chefs prepare food in front of guests—did to boost Japanese food in the U.S. in the 1980s, said Shaun Rein, managing director of Shanghai-based China Market Research Group. Only in the past several years have Chinese companies significantly embarked outside the country. But most have centered on sectors like energy and manufacturing. Mr. Zhang is one of the few who have gone after consumers. Gilles Sabrie for Wall Street Journal A magician in traditional garb performs at the restaurant. “One great thing about Americans is that they are a very curious group of people,” said Mr. Zhang. 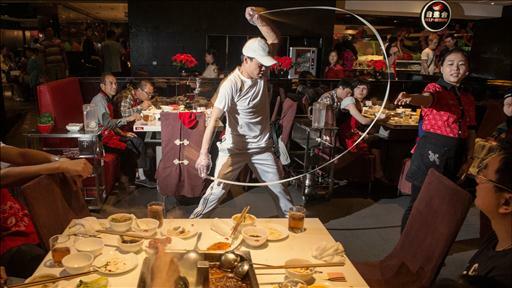 In China, every Hai Di Lao employs a handful of “noodle masters,” who train an average of four to six months before starting to perform their dance in the middle of the dining room. They stretch foot-long wads of dough into at least 10 feet of slender, ribbonlike noodle by whipping the center out like a jump rope and rippling and swirling it through the air like the ribbons twirled by Olympic rhythmic gymnasts. Often, the dancer flings the dough over customers’ heads as they squeal and clap, before folding it with a flourish and dropping it in the broth. Another offering Hai Di Lao hopes will attract American attention: a private “cyber” dining room outfitted with two giant flat screens, a sort of large-scale Skype-while-you-slurp concept initially rolled out last year to allow businessmen to replace long plane rides between Beijing and Shanghai with virtual dinner meetings. For a total of $65 per hour, 12 guests—six in each city—meet and eat via private screening rooms. Mr. Zhang says it hasn’t been as popular as he thought it would be, but he enjoys having the option for guests. Hot pot itself isn’t totally foreign to the U.S. market. Yum Brands Inc., YUM -0.50%which owns KFC and acquired Chinese hot-pot chain Little Sheep in 2011, already has a dozen outlets in the U.S. They are predominantly in areas with high Chinese populations, like Flushing, N.Y. According to the most recent census, Arcadia, Hai Di Lao’s new U.S. home, is more than 50% Asian. Tong Xin, a 22-year-old college student in Beijing, once arrived at Hai Di Lao after getting caught in the rain. “They took one look at my soaking sneakers, offered me slippers and somehow managed to dry my shoes out by the time I left the restaurant,” said Ms. Tong. She says she eats at the chain about once a month. The staff doles out a steady stream of hot towels and other niceties: hair elastics to longhaired customers (to prevent hair from falling in food), eyeglass wipes to the bespectacled (all that steam can fog one’s vision) and plastic bags to phone-toting eaters to protect mobiles from getting messy. Unlike at many Chinese restaurants, patrons don’t have to yell out for menus or checks. In the restrooms, they have access to an array of free perfumes and lotions. Wait lists for tables on weekends average 50 to 75 names in peak traffic times. 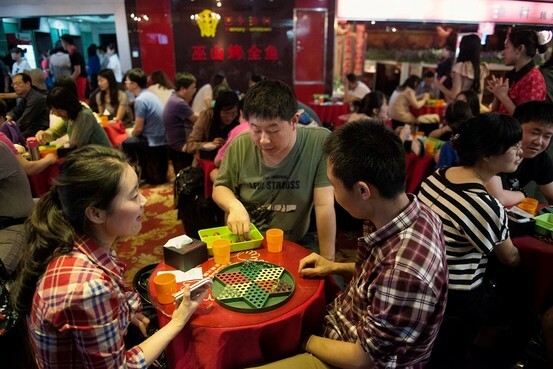 Like many customers, Zhao Xiaoyi, a flight attendant in Beijing, is willing to wait for a full hour, playing chess and snacking on cherry tomatoes and animal crackers. “It’s absolutely worth the wait,” Ms. Zhao said. Hai Di Lao’s 75 outlets made more than a 10% profit on 3.127 billion yuan ($510 million) in revenue in 2012, up 54% from a year earlier, Mr. Zhang said. The entrepreneur is well aware that not every trick in his playbook will work for the U.S. market. Manicures in restaurants aren’t likely to pass muster with U.S. food-safety inspectors. Costs for amenities like hot hand-towel service and dancing wait staff are bound to be higher in the U.S., just as they have been in Singapore. Some broth flavors, like the sour vegetable fish soup, may not translate, either. Mr. Zhang said he would tweak the menu to fit consumers’ tastes, but using chopsticks to eat remains a must. He also said he would offer individual pots for U.S. customers rather than the group caldrons used in China. The reason, Mr. Zhang said, is that Western dining is more individual. “Whatever they want is what I’ll give them,” he said. There is a substantial number of emerging market companies of all sizes seeking to export their goods and services in the areas of IT, technology commercialization, component manufacturing, agriculture, energy, biofuel, foodstuffs, beverages and spirits, aerospace, defense, oil and gas services who stand to benefit tremendously from entering or expanding their presence in the American markets. There are also entire medium size (US$15-500 million business and project development sectors across many emerging market countries that are begging to be funded and there are funds readily available in the U.S. to fund tens, even hundreds of companies and projects in sectors ranging from hospitality, food security and ICT to agriculture and alternative energy. Injecting significant funding into this slice of emerging market economies will generate thousands of new jobs; increase corporate efficiency and productivity by introducing latest western technologies and production tools. It will also create a multiplier economic effect, which will reverberate throughout the country’s business and consumer sectors. Yet, for the last couple of years, only a tiny sliver of the entire American originated debt and equity financings that could have been done in many emerging market countries has been completed. The big question is WHY? Of course, global economic recession has played its part. Yet for those of us who are focused on cross-border market entry services, marketing, financing projects, enterprises and trade, the answer is pretty simple – Disconnect, Distrust and Deficiency, or as we call them 3Ds. There is disconnect in understanding of western financing, or market entry processes and of the requirements set forth by the U.S. Government agencies, businesses, consumers and financial institutions. Many businessmen from emerging market countries spend a lot of time and effort in putting together sleek looking presentations overloaded with information, setting up technical models and writing business plans using prepackaged software. Yet, most of them fail to truly understand the needs and requirements of the American consumers, businessmen or financiers and their focus on product reliability, branding, compliance requirements, project’s ownership, provenance, due diligence etc. They also do not understand the fact that unless they commit financially to the market entry or capital raising processes, they will not be perceived as serious players. There is also a huge image problem that many countries have in the West. Although some of it is well deserved, a big part of it is gloom and doom that does not accurately portray the situation in those countries. Then there is distrust. Over the last two decades, businesses in emerging market countries have been pillaged by every type of western con artist known to man. Many swooped in, promised local businessmen untold riches, massive credits and investments, collected fees and then vanished. No wonder today companies in many countries are wary, scared and mistrustful. To stimulate the process a modest amount of support from the federal and state governments, investment promotion agencies, national industry associations and chambers of commerce will be needed throughout emerging market countries. 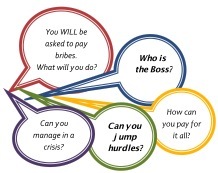 The Government should use one of its several investment promotion agencies to work with those of us in the private and US non-profit sectors in order to provide official endorsement, information dissemination, and participation leadership to encourage, or even mandate local businesses to take part in the process without fear of being duped. This endorsement and support, will be combined with a focused private sector effort to train local companies on how to more effectively access US markets; educate American investors on the benefits of doing business in emerging market countries; change negative image plaguing many countries through strategic public relations and information efforts; and provide effective networking opportunities for trained and qualified local companies to meet potential qualified investors, partners and customers on an ongoing sustainable basis.. Simply given the current portfolio of alternative energy, agriculture, infrastructure and ICT projects, which we are reviewing, we can confidently say that with just a modest amount of local government support, combined with corporate focus, training and financial commitment, emerging market companies can attract at least US5 Billion in low-cost debt, equity and trade financing in the next 18 months. Thousands of jobs and the multiplier effect generated by this initiative will help the government strengthen its business electorate base, improve country’s investment image and its overall economic condition. American businesses and professionals who are Fluent In Foreign Business stand ready to help small and mid-size companies in over 40 emerging market countries meet the challenge of successfully creating at least $5 Billion of tangible economic value in the next 18 months. March 28thth-30th Broad Street Capital Group, along with Fluent In Foreign Advisory Board will hold a briefing and project review sessions for all interested companies, to select projects eligible for the 2013-2014 financing, export trade, investment and franchising for inclusion into Emerging Markets Business: Keys to America Challenge™. These master class sessions will be taught by experienced professionals selected from a cadre of Fluent In Foreign Academy’s instructors. These workshops and comprehensive on-line support tools will provide qualified corporate participants in each participating country with a unique opportunity to participate in the EMERGING MARKETS BUSINESS: UNLOCKING AMERICAN MARKETS™ challenge and to diagnose their companies’ present “international business IQ”. The workshops will also develop practical useable strategies to position participating organizations for access to the International Financial and Strategic investments, Low-interest Loans, Technology Partners, World-renowned Franchisors and Lucrative Customers. The fee for each workshop will be $749.00 per participant and will include all course materials, as well as a networking reception. The workshops should have a minimum of 20 and a maximum of 50 participants for each session and will feature networking receptions at the completion of the educational session. Each participant who successfully completes the workshop will be awarded Level I certificate from the Fluent In Foreign Academy and will be invited to join the next phase of the EMERGING MARKETS BUSINESS: UNLOCKING AMERICAN MARKETS™ challenge and to participate in the online training modules and upcoming seminars. They will also be invited to apply or participation in the UNLOCKING AMERICAN MARKETS™ Conference at Sea™ in May of 2014. State of your Company and how competitive is it now? These masterclass workshops will also be available online at the Fluent In Foreign Academy™. First workshops are being scheduled for Lithuania, Kazakhstan and Ukraine and will take place end of March, early April of this year. Scheduled dates, times and workshop locations for each country will be announced shortly on this page and in the Fluent In Foreign Business Weekly newsletter. The highlights of Challenge will be chronicled in this blog and the full account will be published jointly by the Princeton Council on world Affairs and the Fluent In foreign Academy in the eponymous book to be released in October of 2014.